Jessie Senese, who you might know better as Sweet Jessie, is one of my favourite bloggers. 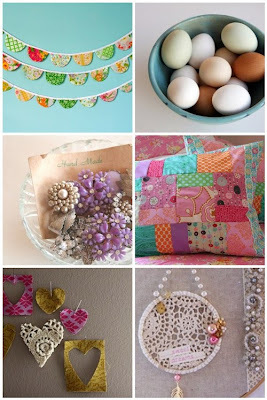 From beautiful stitched and embroidered pieces, to paper goods and wonderful vintage finds, her work is the very essence of pretty. Being as sweet by nature as she is by blog-name, Jessie took time out this week to send us a birthday card and message – the first, for our first. 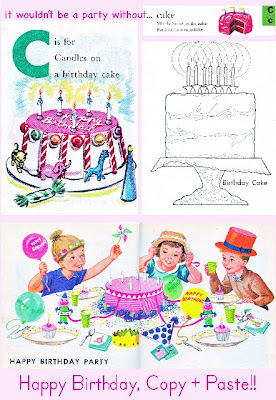 I sat on the floor looking through all of my favorite vintage books, and came up with a darling selection of birthday and cake-themed images . . . I hope you like them! Wishing you many more happy birthdays! Clearly, we love them – how could you not? In case you’ve yet to discover her blog, I’m going to be presumptuous and direct you first of all to a couple of especially droolworthy posts (although you may well want to stick around and browse afterwards). Stitchers, sewers and fabric-lovers should try this one, and for fans of paper and vintage, this is pretty much guaranteed to set your head spinning. Be still my beating paper-heart! You can also find more of Jessie’s photos in her Flickr stream and snap up a piece of the lovely in her Etsy store. Thanks so much for coming to the party, Jessie!